Burgers and cocktails combined with rock and pop memorabilia on the walls, the Hard Rock brand should be familiar to everyone. 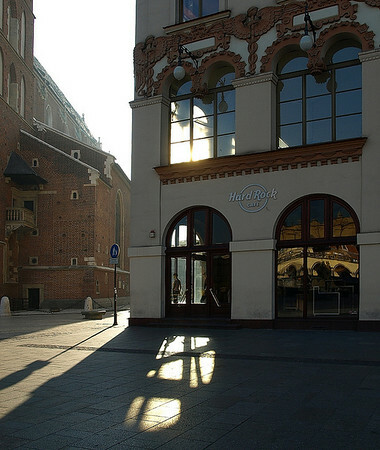 Bedecked with the familiar rock’n’roll memorabilia, Kraków’s branch of the Hard Rock Cafe has an enviable upstairs view of the Main Square going for it. The food is as expected: burgers, cocktails, and chips in a cup, with service and price to match. You also get to see clothes and instruments connected with well-known Kraków bands Oasis and Depeche Mode, and an embroidered poncho worn by Jimi Hendrix.